This CD has the Atlantic classics Wardell Quezerque's productions + tracks from Willie Tee's own Gatur label. 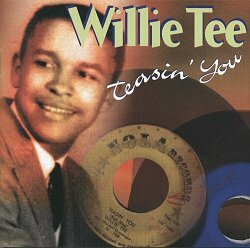 The title track "Teasin' You" has become a New Orleans Mr Cool golden oldie together with "Thank You John" and "Walking Up A One Way Street". The rare "Teasing You Again" and "You Gonna Pay Some Dues" are also included. Making this a must have CD. Available on CD 7132 Night Train International USA.